Bakersfield, pop. 231,000, is 112 miles north of Los Angeles. Some of Bakersfield's tickets can be ignored. If your "ticket" does not have the Superior Court's name and address on it, it is what I call a "Snitch Ticket." For more details, see the Snitch Ticket section at the top of the Your Ticket page, and Set # 15, below. 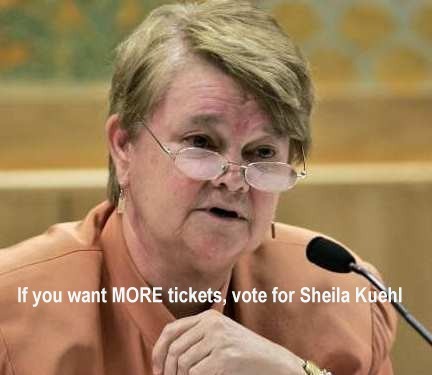 Zev "termed out," and in the Nov. 4, 2014 election Sheila Kuehl won the race to succeed him, by a narrow margin. This is the City's first press release about the missing warning signs. Sometime later they issued another press release about the missing signs, giving details about how the refunds would be handled. It is interesting that they issued that many tickets in just half a month. That would be about 1200 tickets in a full month. At that time that was the highest rate of ticketing I had seen anywhere. Sets # 3 thru 7 and 9, below, discuss other refunds the City should have made, but did not. Be sure to read the footnotes! Except where noted, and except for the column where the totals exclude cameras COST and ORMI, the annual and monthly totals are as provided by the City. Some monthly totals are from the 2008-2013 tally in Set # 14, below. These 2006 and later annual citywide grand totals, or projections, are by highwayrobbery.net. The 2016 and 2018 projections are based on just the data displayed in the table. Un-used column, to allow for later expansion of City's system. 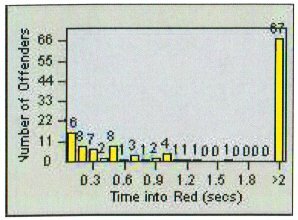 Figures in red type (or, if you are looking at this table in black and white, the upper figure when there are two or more figures in a cell) are what RedFlex calls Total ViolationsRecorded, or all incidents recorded by the cameras. The figures in black type are what RedFlex calls Notices Printed, and represent the sum of genuine citations issued (those filed with the court) plus any Nominations mailed (not filed with the court, a.k.a. Snitch Tickets). Due to time limitations data may have been posted to the table only for selected months or locations. If there is sufficient public interest, the remaining months or locations will be posted. Full official data has been received and is available at one of the links given above. Intersection-by-intersection data has been requested but has not yet been received. The camera enforcement is on traffic on the first-named street, but the direction of enforcement (north, south, east, west, thru, left) has not yet been verified. Official data has been received, is available at the links above, but due to time constraints has not yet been fully posted to the table above. On Jul. 20, 2004, the yellow for through movements at Ming / South real was increased from 3.5 to 3.9. See Docs Set # 3, below. The count for this month is not known. However, the 2003 annual total given reflects all 12 months. The yellow for eastbound through movements at Ming/99/Valley Plaza may have been too short. See Docs Set # 9, below. The report for this month was generated less than ten days after the end of the month, so not all tickets (for violations which occurred during the month) may have been approved and counted by that time. 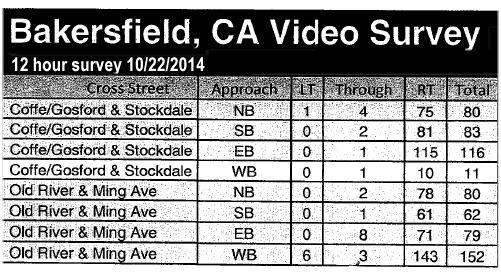 In Nov. 2015 new cameras were activated at two new intersections: Coffee/Gosford and Stockdale, and Old River and Ming. See Set # 10, below. The monthly total for this month is by highwayrobbery.net. Per the City's annual reports, right turn ticketing in 2016 was more than triple what it was in 2013 and 2014. The numbers are displayed in blue in the rightmost column in the table above. As of May 2018 ticketing by the original twelve cameras (which excludes the new cameras at COST and ORMI) was about twice what it was in 2014 and 2015. Also, the Notices Printed as a percentage of Violations Recorded was the highest it had been since 2013. On Oct. 15, 2004 I received the signal timing charts for Ming / South Real. There was a current one, created on July 20, 2004, showing 3.9 second yellows ("yellow change") for all four straight-through movements. The speed limit on Ming is 40. In a 40 zone, the required minimum yellow is 3.9 seconds. (See Defect # 2 on the Home page.) Thus, many of the tickets issued on or before July 20, 2004 could be invalid. Many of the tickets issued at Ming / South Real are probably for westbound left turns, for which a 3.0-second yellow is arguably legally long enough (even though it has the practical effect, compared to a 4.0-second yellow, of doubling or tripling the number of cars running the left-turn). So, if in the future there is a refund due to the too-short (3.5 second) yellow, it will probably apply only to straight-through traffic, not left turns. To see more about the issue of 3.0-second yellows on left turns, see the second part of Defect # 2, on the Home page. information to support its position that the citations are valid." The police said (above) that they issued the tickets "in good faith." They claimed that they didn't know the law had changed (years before) and that a longer yellow was mandatory. "Ignorance of the law" is no excuse for us civilians, and it should not be for the police and the City. The police cannot argue that they prosecuted the tickets in good faith because, when they found out that the yellow was too short (obviously they knew by July 20) they should have stopped all prosecution of the tickets they then knew to be invalid. But they didn't stop. If you think that is prosecutorial misconduct, see Set # 6, below. More about Ming/South Real is in Sets # 5 - 7 below. Court Congestion - Caused by Camera Tickets? On the website of the Kern County Superior Court ( http://www.kern.courts.ca.gov/ ) I found the following Aug. 5, 2004 notice. Due to a large increase in the number of tickets received by the Traffic Division of the Superior Court, many of our customers are being inconvenienced by appearing at the court on the date given on their traffic ticket, only to be given another date because the ticket was not in our system. The court is endeavoring to reduce the entry time for this large increase in traffic citations and hope that any inconvenience is short term. Here is one defendant's November 2004 experience in the Bakersfield court, in his own words. Thank you for your very helpful web site, and special thanks for the Bakersfield yellow light timing information. The vehicle it appears I was driving was videotaped in June 2004 at the Ming and South Real intersection heading west on Ming. The speed limit was 40 mph and the vehicle was going 32 mph (which calculates to be 46.9 feet per second) according to 2 photos taken from the video. The first photo taken at 0.2 seconds after the light turned red shows the bottom of the vehicle's front tire (where it contacts the street) at the first, or most easterly, of the crosswalk lines. The front bumper of the vehicle was 3 feet into the crosswalk. At Time Zero (the instant electricity was applied to the red light) the vehicle would have been about 9.4 feet (46.9 x 0.2) back from there, with its front end about 6 feet from the line. According to the officer who was present at my trial, the crosswalk is 8 feet wide and I would have had to be at or beyond the second crosswalk line under the yellow light to have legal "control of the intersection," which apparently means something like the right of way. The Judge had some problem with that because the section of the law the Judge was looking at indicated that a vehicle entered the intersection when it crossed the first crosswalk line. Since the front of my vehicle was about 6 feet from the crosswalk at the instant the red light came on, the discussion between the Judge and the police officer about where the intersection began was moot as applied to my case. I mention this here only because it might apply to others' cases. The officer agreed that the yellow lights at Ming and Real were set to stay on for 3.5 seconds until July 20th when they were reset to 3.9 seconds. The officer was very adamant that 3.5 seconds was the correct timing during the period when my violation occurred. Apparently he thought that CalTrans had not changed the timing specification until July 20, 2004. Thanks to your advice, I had visited the CalTrans web site and had made a copy of the regulations affecting intersection lights, etc. (40 pages of which the light timing table was just a small part of one of the pages near the end of the document). I showed the Judge that document and brought to the Judge's attention the fact that the document was dated May (20th I believe), 2004, so the yellow light should have been set at 3.9 seconds prior to the time I was alleged to have violated the red light. [Editor's note: CalTrans changed that spec in 1998 - see Defect # 2 on the Home page of this website.] That extra 0.4 seconds would have enabled me to be well into the intersection under the yellow light. I told the Judge that something was terribly wrong with the timing of the light at Ming and Real because tables available at your web site indicated that typically over 500 red light violations occurred there each month and on at least one occasion exceeded 900. I also reminded the Judge that most of the red light offenses heard in the Judge's Court that morning were at Ming and Real. The Judge told the police officer that the City of Bakersfield needed to abide by the standards set by CalTrans. The Judge wanted to review some sections of the law before making a decision in my case, so I agreed to wait for the Judge's decision which I received by mail yesterday. The letter, which was from the Court Clerk, stated, "You were found not guilty at your trial," and "Cash bail will be returned to postee in approximately four to six weeks." I had to pay the bail amount prior to being permitted to go to trial. Bail is set at $371, which is the fine one pays unless one goes to Court to fight the ticket. It appeared that those who go to Court typically paid about $150 - $200. Five-hundred-fifty violations per month at $371 per violation is $204,050. Ming and Real is a real cash cow and it is easy to understand why the City of Bakersfield fights so hard to make those tickets stick." Regarding the issue of how the officer established the identity of the driver, the Judge had a computer into which the officer was allowed to insert a CD which had the video on it. I was allowed to approach the bench so that the Judge, the officer and I could view the video together. The display would have been difficult for the rest of the people in the courtroom, except for the bailiff, to see. I was surprised to see all of the parties who had apparently plead "not guilty" offer no, or at best, a very minimal defense. They were most likely hoping the ticketing officer would not show up. I believe the Judge offered each of them the opportunity to take traffic school, which most of them did. Fines for red light violations, with the traffic school add-on, were around $200. A James Burger article in the Dec. 21, 2004 Californian (page B1) carried the headlines: "Officials Admit Yellow-Light Oversight" and "BPD says it won't cave on tickets despite city's failure to adjust signal." The text of the article said: "The City of Bakersfield has another red-light camera problem. But if drivers want their tickets dismissed this time, they're gonna have to fight for it." The article is about the short yellow discussed in Docs Set # 3, above. If you have a straight-through (not a left turn) ticket at Ming/South Real and the violation date is before July 20, 2004, I believe you're entitled to a dismissal, or a reversal if you have already paid it. Whether or not you're able to take the time to go through the steps necessary to get a dismissal or reversal, I suggest that you take a little time now to file a complaint with Attorney General Lungren in Sacramento. He has an on-line complaint form at: http://ag.ca.gov/consumers/mailform.htm . I wrote what follows for a defendant who just wrote to me and said that he pled guilty and paid his Ming/South Real ticket (straight- though, not a left turn) four or five months ago but now wants to get his money back. "First step would be to get and fill out a one-page "re-open" form - a request to be allowed to re-open your case and get a new trial - then file it with the court clerks. (Full title of form: "Bail Forfeiture Set Aside Motion to Re-open Case." This process is authorized by CVC 40512.) The clerks will schedule a date for you to go before a judge to ask him to grant the request to re-open. If the judge grants the request to re-open, then you can plead not guilty and get a trial date. (That first judge you see will also have it within his power to clear the matter for you right then and there, without you having to go to trial. So ask that judge to reverse your conviction. But it will depend upon the judge.)" "It becomes more difficult to re-open a case that has been closed for more than 6 months, so you will need to start without much delay. To figure the 6 months, you need to know that cases are closed once the fine has been paid and proof of attendance at traffic school (if required) has been received by the clerks." "If you end up having to go to trial, at that trial you would go though an abbreviated version of the trial described in Bakersfield Documents # 5, above. Hopefully very abbreviated. With the article in this week's [Dec. 21] Californian, I think that by the time you get to court all the judges should be familiar with the problem so that you won't have to do much explaining." "If going back to court is going to cost you money for lost work or travel to court, etc., you may want to consider an additional filing - filing a claim with the city for the costs you have incurred, and will incur, due to their mistaken prosecution. The process would be similar to what I describe on the Costa Mesa Documents page. I would recommend filing it right away because maybe the city would prefer to reverse your ticket themselves, so that you don't run up any more expenses that they will have to pay. You get the claim form from the city." "In most courts you can get a re-open form from the clerks at the courthouse, fill it out at the window, submit it, and you've got a court date. However, I was just checking on the Kern court's website and I see that they have recently posted a copy of the full formal routine they would like people to go through. Also posted is a sample form. It's all at http://www.co.kern.ca.us/courts/Informational_Sheet_Traffic.pdf. [As of March 2005 the link ceased working.] They probably had to post it because of so many people applying to re-open their Ming/South Real camera tickets. I suspect that in reality the process is more-streamlined and less formal." If you already have been through the re-open process, please send me details about whatever steps you went through to get your money back, so that I can post more information here. Also note: This simple process would not apply to a case where you went to trial and were found guilty. On June 7, 2005 a defendant sent me a copy of this signal timing chart for Ming / 99 /Valley Plaza. It showed a 3.5 second "Yellow Change" for the eastbound ("EB") movement (or "phase"), which is too short. The speed limit on Ming is 40. In a 40 zone, the required minimum yellow is 3.9 seconds for a thru movement. (See Defect # 2 on the Home page.) Thus, many eastbound tickets could be invalid. On June 8 and 10 I phoned the City traffic engineering department to see if the chart, which bore the inscription "printed on 8/26/2004," was still current. During the conversation of the 8th, they told me it was. On the 10th I phoned Lt. Borton, who runs the camera program, and he told me that he thought the yellow had been increased to 3.9 sometime in 2004. Later that day I called traffic engineering again. This time they told me that they remembered lenthening the yellow in 2004, that it probably was done around the same time (July 20, 2004) as the yellow at Ming/Real was lengthened, but that the only notation as to the exact date would be on the documents kept in the signal cabinet at the intersection. I then filed a request for copies of those documents. On June 16 I got a call from a traffic engineering staff member who told me that the chart (above) had been mis-labeled as to phase assignments, and that the City was mailing me a corrected chart. I will post a copy of the corrected chart here, as soon as it is received. Despite the confusion about the labeling on the chart, I think that it is still likely that the yellow was too short on tickets issued before July 20, 2004 - of which there are about 170. In the meantime, if you have a Ming/99 thru ticket, I suggest that you get a copy of the video (do a Discovery) and check the length of the yellow by playing the video frame-by-frame on your computer, using a program like Windows Movie Maker. These statistics, obtained from the City in Jan. 2014, were an early indicator of what would happen when it came time for the city council to decide whether to continue the program, or let the contract expire. To see how the cost neutrality works, go to Set # 14, below. In March 2014 it looked like the police might extend the contract for just one year, but then a new staff report came out, asking the council to vote on a two-year extension. At the June 4 meeting the council adopted the extension, without discussion. On Apr. 22, 2014, highwayrobbery.net wrote to the Bakersfield PD business manager, and suggested that he negotiate the rent. The contract presented to the council on June 4, 2014 did not address the rent, so the City paid 93% too much (compared to Elk Grove prices) over the two years of the extension, $466,704 extra. To cover that extra rent, the City needed to issue an extra 4667 tickets (assuming that the City receives an average of $100 for each ticket issued). And there was no way out. The contract did not contain an escape clause - a way for the city council to end the program, or renegotiate the price, before the two years is up. On Aug. 12, 2015 the city council reviewed a two page staff report (which did not discuss safety, at all - it was just about adding more cameras, and money), discussed the matter for six minutes, and voted 6 - 1 (Maxwell: nay) to sign contract amendment # 3 which extended the program to Aug. 2020. They agreed to pay $39,100 monthly rent for the twelve original cameras, but since those cameras were all more than ten years old at that time, they should not have agreed to pay a dime more than $18,000 per month ($1500 per camera). Over the 60 months of the extension, the City will pay $1.266 million extra rent, and to cover that extra rent the City will need to issue an extra 12,660 tickets. It is unclear whether the top paragraph on page two of the staff report was a "finding of fact" as required by CVC 21455.5(c)(2)(A) for the four new cameras. Neither the minutes of the meeting nor the video shows any discussion of a finding of fact. Here is the survey RedFlex conducted to show the potential ticket production by the new cameras. For info about how much net revenue the program makes, see Set # 14, below. For more info about what other cities pay, see FAQ # 17. This list of contracts and amendments was up-to-date as of June 22, 2018. Anchor Robin Mangarin: Red light cameras can catch you red handed, but what if you weren't the one behind the wheel? Should you be compelled to snitch on your wife or kids if they get caught running a red light? KGET-17's Kiyoshi Tomono has the story of a Bakersfield man who faced that very dilemma. Reporter Kiyoshi Tomono: A flash of light and suddenly you're caught on camera and getting a ticket for running a red light. It happened to local lawyer Bill Slocumb. Thing is, neither he nor his wife was behind the wheel. “My stepdaughter ran the red light southbound on Coffee Road onto Truxtun Avenue,” said Slocumb. But Slocumb’s wife got the $350 ticket. In the same envelope was a form encouraging the couple to divulge who may have been driving if it wasn’t them. They decided to fight in court. Slocumb said the judge didn’t push the issue and dismissed the ticket, but the Bakersfield police still wanted to know who was driving. “The officer who apparently runs the red light program demanded [[during a phone conversation before the court session]] to know the name of the driver, the address of the driver, whether I knew if she was a California licensed driver or not, and we simply told him that we were not interested in providing that information,” said Slocumb. But does the officer's request or the city's form have any teeth? Police said it’s a matter of civic duty and safety. DeGeare said not being able to identify the driver is not the norm. Reporter Tomono: Bottom line, read the fine print. Slocumb said he thinks he’s lucky because he’s a lawyer. “I guess it was a happy ending and we moved on with our lives,” he said. From KGET-TV 7-20-05, with emphasis added, and clarifying notes, in [[ ]]. I say: You are not required to tell anyone who was driving the car, so the mandatory "must" is incorrect, and should not be on a court website. See the "It's Not Me!" section on the Your Ticket page. The City has provided bar graphs of Late Times, etcetera, for each of its cameras, on several occasions. Invoices, vouchers and spreadsheets show how cost neutrality works. To see an example of the City's fake/Snitch Tickets, go here. when a red light violation occurs and is captured by the Redflex system."